The Baader Oxygen III is among the best very narrow bandpass Nebula Filters. These are often referred to as light pollution rejection filters but their effect is more encompassing than that alone. This Oxygen III filter is a genuine bandpass filter made so that only a small portion of light in the visual doubly ionized Oxygen III portion of the spectrum is transmitted. This filter will pass only six (6) nanometer half width centered at 496 and 501 nm Oxygen III lines, with transmission of ninety three (93) per cent of that light in the portions of the spectrum commonly emitted by diffuse and emission nebula (the Veil, North American, or Dumbell Nebula for example), and planetary nebulae (Ring Nebula for example). By rejecting most other light this will cause certain nebula appear more clearly against a blacker background of space. This is among the first two Nebula Filters generally recommended by Company Seven to our customers who have a suitable telescopes: premium quality Apo refractors of 80mm and larger, Achromatic refractors of 100mm and larger, or reflectors of 8 inch (20cm) or larger) for the task of hunting out fainter objects. Right: Baader 2 inch Oxygen III filter with provided plastic case. Also available in 1.25 inch. (89,185 bytes). Click on image for enlarged view (102,167 bytes). How Do Nebula Filters Work? These filters are a helpful accessory used with telescopes and binoculars to better view or photograph some types of the faint objects outside the Solar System. Filters of the Oxygen III variety specialize in showing diffuse emission and planetary nebula. Street lights, especially the poorly baffled ones, cast a greenish or golden glow upon the otherwise black night sky. Particulates and humidity in the atmosphere refract and reflect that light rendering the sky background brighter, hence the fainter objects become harder to see against the brighter background. Nebular filters filter out a high percentage of the street lighting effects thereby making the background of the night sky appear blacker; faint objects stand out better against the darker background. While these are obviously beneficial for those who live near sky light polluted suburban areas, Nebular filters are helpful even when observing at darker rural settings since they also filter some of the naturally occurring background glow. Note, these filters can not help to attenuate light from neon sources since these emit across a wide bandwidth. Narrower, and narrower bandpass filters become more and more specialized and may actually cut down the light coming from some of the brighter emission nebula; for example M42 the Great Nebula in Orion looks great with no filter, better with a broad band nebula filter, but much of the extended portions of the nebula disappear when observed with a very narrow band filter. In the way these filters work, they will still absorb some light from desired object. And there are objects that they can not help one to see better including stars, star clusters and galaxies since these emit light from all wavelengths including those emitted by street lights. And so a pronounced darkening of these objects will be observed with the filter in place. Observers with smaller telescopes will do best to operate at the lower magnifications, on the order of 10x or less per inch of aperture. While those with larger apertures or more efficient mid to large refractors will do well to span from low to higher magnifications. Nebular filter coatings present a metallic, mirror like quality. As such one should use care to use the filters away from bright sources of stray light an with a well baffled telescopes. A darkening hood or blanket over the observer's head may help to keep reflections coming back to the observer, and darken the sky background seen even further. The filter is made with a disc of transparent optical glass that has been ground to be plane parallel and then polished until very smooth. The glass undergoes a vacuum deposition coating process where numerous micron-thin coatings of various elements are applied one upon another in a precise order and thicknesses. The filter element is housed in a machined aluminum cell, retained by a thread in retaining ring. The filter name, size and part number are in silver, and this mirror like print when combined with the small print size make this information difficult to read under dim red lighting. Company Seven recommends our customers keep these filters in well organized accessory cases, so that you know which filter is which. It helps to become familiar with how the elements appear too (read descriptions below). Nebula Filters are made up of micron thin layers of materials deposited onto an otherwise transparent optical glass window. The coatings are calculated to transmit desired wavelengths (portions of the visible spectrum), while simultaneously rejecting a high percentage of other wavelengths. Depending on the type of filter (broad band pass or narrow band filters including Oxygen III) these filters pass light in the nebula lines which may include Oxygen III, Hydrogen Alpha, and Hydrogen Beta lines of the spectrum. In a more perfected nebula filter a higher percentage of light is transmitted in those desired wavelengths, as much as 80 to 90 percent being typical. When tilted while exposed to bright light then both the filter surfaces will appear like a silvered mirror. And when tilted it will present with greenish undertone around the perimeter of the female side, and a magenta around the perimeter of the male side. When viewed with no backlighting and parallel to the eye from either side, then the filter element appears to impart a bright green cast, if the filter tilted to a steeper angle this changes from green to violet tones, and as the tilting advances it will ultimately show blue and then magenta tones. 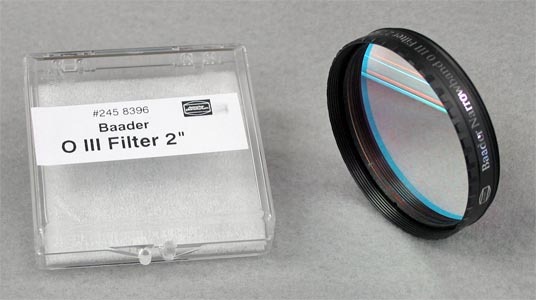 The Baader Oxygen III filter is made available in diameters of 1.25 (31.7 mm) or 2 inch (50.8 mm) so that it can be installed in line onto many accessories, or directly onto most popular eyepieces. This filter is among the narrowest transmission O-III filters on the market as such it effectively blocks the entire visual spectrum with the exception of the O-III transmission lines. By means of its sophisticated optical fabrication and coating technologies it eliminates the annoying colored halos that often surround stars when seen though some other O-III filters. It is a surprisingly long lived, durable filter featuring the same ultra-hard, extremely durable vacuum-deposited dielectric coatings employed on the Baader UHC-S Nebula filters. Since the transmission of the light in the OIII is so efficient, fainter nebula seem to appear brighter and the extent of nebulosity that can be seen is greater - you will see more of the fainter components. Since the transmission of the the other regions is so limited the background appears blacker, hence what is visible is more clearly contrasted against its background. Stars appear more natural, smaller, and more intense - stars are not bloated or halated by this filter. No image degradation is perceptible even at the highest magnifications. Right: Baader Oxygen III filter transmission curve (111,052 bytes). The glass elements used to make the Baader Filters are free of striae, optically finely polished plane parallel to within 30 seconds of arc. This eliminates any double images or ghosting due to wedge errors in the glass. These filters tend to far supersede the quality of common color filter elements which are flame polished. The combination of their fine optical craftsmanship and a comparatively thin 2 mm profile allows these filters to be inserted anywhere into the optical path without introducing astigmatism or other noticeable defects into the image. For instance they can be installed in the front of a Binocular Viewer without degrading the image in any way. All filters will thread into conventional slip fit eyepieces or accessories with the common 1.25 inch diameter x 42 tpi (28.5 x 0.6 mm) or 2 inch (50.8 mm) threading. These thread patterns have been tested and optimized to fit allmost all eyepieces on the market. Stackable filters: each filter cell incorporates both a male and a female thread to allow stacking the filters to obtain even narrower passbands or special effects. The filter cells features the largest clear aperture of any 1-¼ and 2 inch filters on the market - for complete freedom from vignetting at any focal length. The front crown of the cell incorporates milled notches which makes handling and threading the filter an easy operation in the dark. 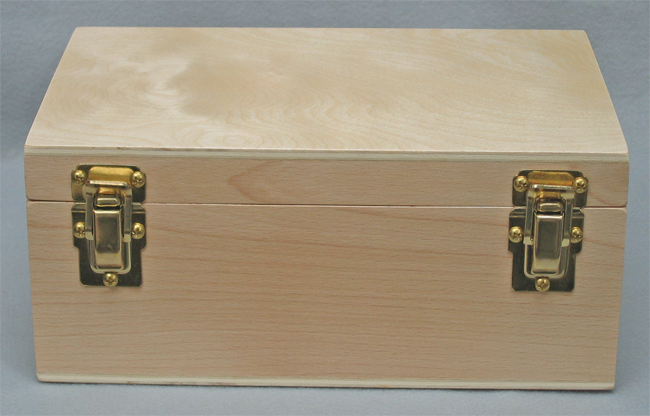 The optional wood case is foam lined with cutaway spaces for filters, eyepieces and other small accessories for your telescope. Please refer to our price list for current prices for the filter set and the optional case or contact Company Seven for more information. Baader Planetarium Professional Astronomical Filters one page color illustrated overview of several Baader specialized astronomical filters including the Oxygen III Narrow Band, Contrast Booster, Color Filter Set, UV-IR Rejection, Fringe Killer, Moon and SkyGlow, Solar Continuum, UHC-S High Transmission Nebula, and U-Filter. Includes filter transmission curve graphs. Publication content by Baader Planetarium, all rights reserved. From Company Seven's Archives (127,011 bytes in Adobe .pdf).